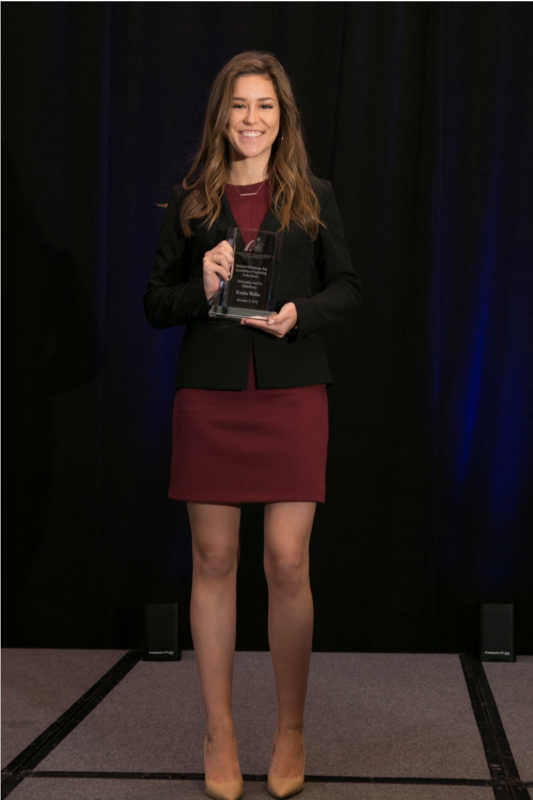 A passion for helping others led to first-year mechanical engineering student Brooke Waller being awarded the 2018 Outstanding Youth in Philanthropy Award from the St. Louis Chapter of the Association of Fundraising Professionals. 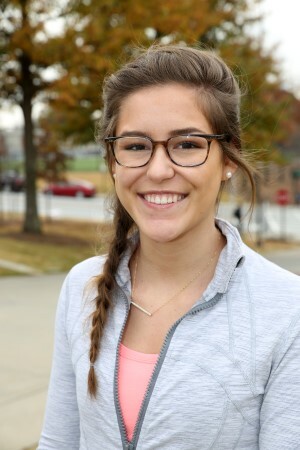 In this Q&A she talks about her volunteer work, why she chose Georgia Tech, what drew her to mechanical engineering, and what she loves about being here. I'm from St. Louis, Missouri. I was born in a small town in Illinois, but I've lived in Missouri most of my life. I have identical twin brothers who just turned 15. It's a lot of fun. I like to watch their soccer and basketball games. What were you involved in while you were in high school? In high school I worked in a local restaurant, called Sugo's. It's an Italian place. It was pretty much my favorite thing I ever did. I got really close to everyone who worked there. I played basketball for a little while in high school, but then our team kind of fell apart and that's how I wound up at the restaurant. I also went to church and volunteered. That's how I filled my time. How did you get involved in volunteer work? I got into a charity called Eye Care Charity of Mid-America. My dad was on the board, and they had a grant to fulfill for Hispanic children. A lot of them don't speak English, and they're in kindergarten, first grade, second grade, or sometimes older. They have two buses that serve as mobile eye clinics, so they brought me on to the bus and I acted as a translator for the kids and the doctors. I just tried to make them feel more at home. It's a strange environment for them to be in, so I tried to make it a little less scary. The buses have two exam lanes on them, with two doctors. The kids come in and they see a doctor, and they get their lenses cut the same day and they walk off the bus with a new pair of glasses. It's a big help to at risk youth. If they can't see the board they aren't going to be able to do well in school. It helps them break the cycle and find success in school. I worked with them for two years. Then during my senior year in high school I was the executive director for Ladue Dance Marathon. Dance Marathon benefits the Children's Miracle Network of Greater St. Louis which includes St. Louis Children's Hospital and SSM Health Cardinal Glennon Children's Hospital. We provide funding for the extra stuff insurance doesn't cover to make their stay a little bit better, like clown doctors, a library, tutoring services so kids can keep up with their school work as they're in and out of hospital, and that sort of thing. We had 22 members on our board and then I had a co-executive director. My junior year I participated just as a dancer and we raised $44,000. We set our goal last year for $50,000 and we ended up raising $81,000. It was a fun, but very busy year. It was totally student run aside from two faculty advisors who were there to sign paperwork and that sort of thing. It was a group effort and it was very rewarding. Our school had about 1200 students, and the exec board was made up mostly of upperclassmen, then there was a subcommittee called morale that makes up a dance and keeps people pumped up. Our event was 6 hours, all on our feet to honor the nurses who do that every day. How did you become fluent in Spanish? Working in the restaurant is what made me fluent in Spanish. A lot of my friends from work are from Honduras and Mexico, and I was working there four days a week, so I took Spanish in high school but learned exponentially more in the restaurant. I started in the restaurant and volunteering at the same time, but working there helped my Spanish so much. I'm so thankful for that experience. Describe what it was like to win an award for your charity work. Were you surprised? The Association of Fundraising Professionals for St. Louis gave out the award. My youth pastor from my church actually nominated me. I didn't even know about it until my mom told me- I was so surprised. My pastor had to get recommendation letters from Eye Care Charity of Mid-America and Dance Marathon for it. Oddly enough, I found out when I was in Atlanta in April for Georgia Tech admitted students day, so that's kind of funny. I could only accept it if I was able to go home to accept it. I was able to do it, and accepting the award for Outstanding Youth in Philanthropy in November. The rest of the recipients at the ceremony were adults, so it was a little bit intimidating. It was very nice though. My sponsors made a nice video, and that was fun. Has your volunteer work continued at Georgia Tech? I've gotten involved with the Tech Dance Marathon as well, which is done by For the Kids. I'm the manager of strategic partnerships for them, which involves reaching out to corporations to partner on various projects. That's been fun. I'm also involved in Greek life, and I plan to get involved in some of the motor sports clubs on campus. I'm still exploring my options, but it's something I really want to do. My linear algebra TA is involved with GT Motorsports and he's been giving me advice on where I could fit in. My first semester was a whirlwind so I haven't figured it all out yet. As a mechanical engineering major, choosing Tech wasn't hard. I always wanted to go to a school in the South. I looked at northern schools, but I don't like the cold and I think my personality fits the South better. Basically, I wanted a top engineering school, in a big city, in the South. Georgia Tech offered all of those- a top ranked school in Atlanta with all of its resources, in the South. I'm so happy here. This is my place. I started in the summer and I love everything about it. It's definitely a challenge, but that's what I signed up for. That's why I'm here. What are you favorite things about being a Georgia Tech student? I love going to football games. That's one of my favorite social things. But I think it's just been a great fit for my personality. Everyone here is so driven to do amazing things. People take school seriously, and that's how I wanted to live my life. My professors have been amazing- I love all them so far. I'm really enjoying the fact that Tech is everything I thought it would be. What was the biggest surprise about Tech during your first semester? I was expecting it to be challenging, but it was still harder than I thought. I wanted that though. Now I know how to prepare for this semester and I know what professors expect. Being on your own the first time is a challenge for anyone. What drew you to mechanical engineering? I really want to do aerospace and automobile parts manufacturing. Mechanical engineering is a general degree, which gives me the opportunity to move around and try different things. I want to end up in automotive manufacturing or aerospace though, and I know this gives me the tools for both. Do you plan to do the co-op program or study abroad? I'm actually studying abroad this summer through the Oxford program. I've been abroad to Japan, but never to Europe. I'm really looking forward to traveling and taking pictures. And eventually I'm sure I'll co-op, ideally in the automotive industry. Do you think you’ll find a way to combine your academic interests with philanthropy? I'd love to combine philanthropy with my academic interests, but I'm not sure what that looks like yet. I'll be involved in philanthropy for the rest of my life in one way or another. It's so rewarding and has opened so many doors for me. I want to set myself up for a productive future, and just figure out where I fit. I know that sounds broad, but I want to keep an open mind while I figure out how I can make an impact.